Arcus attended the Acumatica 2016 Summit in Olrando Florida and we are happy to provide you some interesting highlights. Overall the dashboards look amazing and will allow customers a rich way to review information. Also on display was a demo of the incredible improvements to the existing Acumatica Exchange integration. This functionality allows users to access Acumatica’s CRM functionality natively in either Microsoft Outlook or using a web client for Microsoft Office 365. Without the need to install any plugins, you have the ability to do things like Creating a new Support Case, add a new Contact, create a Follow Up Task, or link the Email to an existing Customer record. While this sort of functionality has been available for a while in CRM software as a plug-in, what is amazing with Acumatica is that this functionality is completely embedded inside the existing applications. 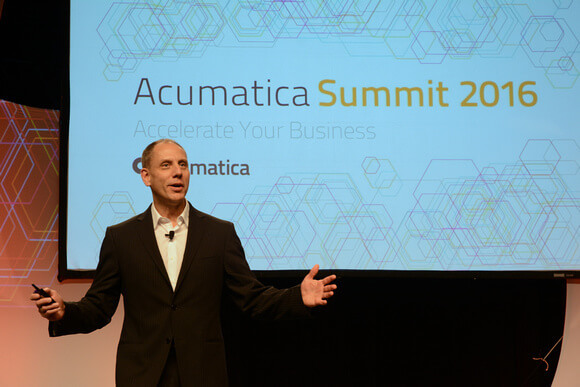 Jon Roskill Acumatica CEO talked at the Summit about how Cloud based applications will undergo a convergence in the next 5 years, and these features provided a great example. All of this is possible due to the modern architecture of the Acumatica platform and it’s ‘standards’ based design. In conclusion, the future for Acumatica customers looks extremely bright, with large R&D investment delivering new functionality improvements regularly, and a thriving growing ecosystem of customers and partners, making it what we believe is the best ERP vendor option for SMEs in the UK today.